Immediately after the surgery you will be shifted to the recovery room where you will be observed for a period of one hour before being shifted to your own room. You will be able to meet your relatives in the recovery room. After assessing your vitals, you will be then shifted out of the recovery room. Most People feel that there is intense pain after Total Knee Replacement Surgery and hence they are very scared of the surgery and the post-surgery period. Remember that the primary reason for opting for Total Knee Replacement Surgery is to have a pain-free life and this life starts immediately once you are taken in the operation theater. We use spinal anesthesia along with epidural analgesia or femoral block during surgery. During the period of surgery you will be completely relaxed and will feel no pain due to the above two. We insert a catheter in your back (epidural) or thigh (femoral) which stays there for 48 hours after surgery. This tube is attached to an computerized pump which gives controlled doses of pain medication This procedure is done by our specially trained anesthetist. We start soft diet 5 hrs after surgery. You will be visited by the anesthetist and by Dr. Amyn Rajani in the evening of the surgery. On the day after the surgery, begin with Knee Rehabilitation Exercises, which were taught to you prior to the surgery begun. All these exercises help in improving body circulation and the circulation of the operated limb there by reducing the swelling. It also prepares you for early walking. These exercises also help in reducing the incidence of calf clots (deep vein thrombosis and lung complications pulmonary embolism) secondary to calf clots. Upper Limb exercises: Done either in sitting or propped up in bed. Raising the arms by the side. Spreading the arms by the side. Bringing the arms together in front. Ability to bend Knee more than 75 degrees. Ability to lift the leg straight up in lying down position. To be able to sit on a toilet seat. To be able to get up from sitting position. 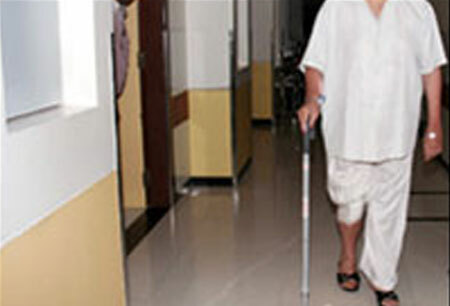 Once you reach your home, a competent physiotherapist will visit you from day 6 to day 15. Sutures will be removed at 15 days. During this 15 day period the physiotherapist will train you to strengthen your muscles and make you move around your locality with the help of a tripod stick. You will be advised to avoid sitting on the floor and using Indian style toilets. Your follow-up visit to Dr. Amyn Rajani will be a month after the surgery.